For starters, I thought it might be useful for me share a bit of my background. I am a short seller in remission though I think the disease will likely return later this year or sometime in 2012. However, I wasn’t always afflicted with a need to sell first and buy later. I started running money as a value guy in late 1982 (after a couple of years as a stockbroker) and I continued on that path until Greenspan drove me out of the business. I became convinced that his policies would be ruinous, both to my way of investing and people in general, so in 1996 I set up a short only fund. My goal was to not only side step the debacle I saw brewing, but to profit from it. Back then, believe it or not, people were afraid of missing the collapse so not only was my fund a dedicated short fund, but I promised to always be short! Obviously my timing was just a bit early in any measurement other than geologic time. Still, I did quite well, as individual research coupled with periodic market declines made up for the rallies, that is until the fall of 1998. From then until the market peaked 18 months later there was no place to hide and I was trampled even without trying to be short Internet stocks. In any case, the experience of being pistol whipped daily caused me to change my strategy in early 2000 from always short to tactically short, which is the only reason I am still alive to talk to you today. Around that same time in 1996 I started to write a daily investment column, which continues to this day at Fleckensteincapital.com. The problem with a daily column, though, is that besides having to write it, you are constantly sharing your ideas, thus making it harder to deliver a novel speech. So for those readers in the crowd who think they have some idea of what I am liable to say, no dozing off or I’ll call on you to come up here to finish this talk for me, without my notes. Anyway, after battling two bubbles and ultimately exacting my revenge on Mr. Market, I finally shut my short fund down in March of 2009. I did that for four reasons: 1. A tremendous amount of damage had been done and not that many stocks were still sporting easily exploitable valuations. 2. More importantly, I knew the response to the burst housing bubble/financial crisis was going to be an epic amount of money printing (which had already begun by then) and I felt it would lead to an environment where making money on the short side would be extremely difficult. 3. Also, I had a comfortable way to profit from the policies that I envisioned would be unleashed, which I will discuss shortly. 4. Lastly, and admittedly somewhat trivially, I was tired of being forced to be pigeon-holed as to how I would manage money. Which is why I am very happy to have a chance to talk to all of you today. As you may have guessed, I’m raising money for my new fund and I hope a lot of you are interested in becoming investors. . . Actually, the opposite is the case; I haven’t raised any new money in over a decade (except very briefly in 2009). Anyway, now that you are all so relieved that you won’t be hearing a sales pitch, I figure that pretty much anything I say ought to sound good to you. Besides, since this is my fifth appearance as a speaker at a Grant's conference, I know this is a pretty tough crowd, so I felt I had to lower the bar so I could easily “beat the number” with my talk. In any case, today I will share with you my opinions about what the financial future holds, and what I’m doing about that, as well as a brief reckoning about how we got here. “How we got here,” being critically important, because in order to develop a forward looking roadmap that has a decent chance of success, you must have a firmly anchored and accurate idea of where you have been and what created the environment in which we find ourselves. I am constantly amazed to hear people discuss their view of the future when it is obvious they have no understanding of what really transpired in the last two decades (or even two years). Of course the beauty of the "Internet Age" is that if you want to know what anyone thought during the equity and/or real estate bubble you can pretty much find out. Though it isn’t my topic today, one of my pet peeves is that, from the perspective of protecting the public, anyone who missed the real estate bubble ought to be banished from the industry for life. However, on the other hand, from a narrow, selfish, money making point of view, we do need some contingent of the investment community to continually misprice securities for the rest of us to take advantage of. And, of course, it is that selfish money grubbing which we all engage in, that has brought us together today. So, let’s quickly review where we have been. Our current adventure began 40 years ago with the termination of the last vestiges of the gold standard. That yielded a decade that ended with 15% inflation and 9% unemployment. It also brought us Paul Volcker and Ronald Reagan, whose policies produced an economic revival in the 80’s, which when combined with single-digit P/Es on depressed earnings delivered a stunning bull market in stocks. Bonds, too, did well as those certificates of confiscation began the decade yielding 12-15% while the Fed was pursuing exactly the policies required to make them desirable. It was a wonderful period, but its ending saw the beginning of the acceleration along the road to ruin in the form of Alan Greenspan. I'm sure most people look at the 90’s as the great decade as opposed to the 80’s, as I have just suggested, and I will grant you that the first few years weren’t so bad, but the road to ruin is a process and it takes time. Greenspan’s dramatic incompetence and recklessness at the controls of the printing press occurred at a perfect moment in time, such that he was able to pursue those policies without triggering any alarms from the usual bogey man – namely CPI inflation. 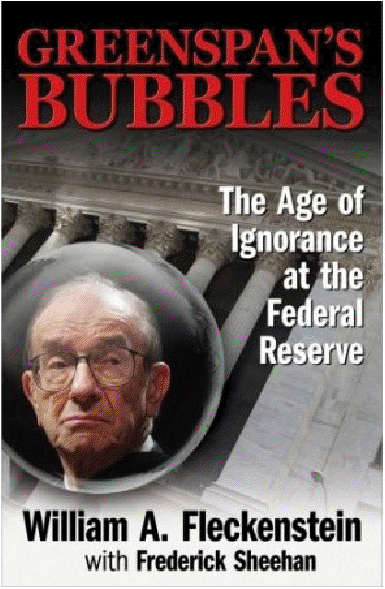 Since I gave a speech on that very subject here in 1998 and I wrote a book about it with Fred Sheehan, I won’t belabor the details, but as we all know that ridiculous stock bubble burst in early 2000. Sadly, rather than learn our lesson and take our medicine, the alcoholic was given more whiskey and we experienced an even more menacing and destructive real estate/credit bubble whose wakeup call arrived in 2008. Essentially 15 years or so of good times seemed to evaporate nearly overnight, but given the massive amount of misallocated capital, the length of time over which it took place, and the warped behavior that went with it, in essence we were just an economic Potemkin village. Our prosperity was an illusion, as leverage masqueraded as liquidity and wealth. Thus, no one should really be surprised that we can’t generate a real economic recovery today. In fact, it was knowable during the real estate bubble that the bust would be like this (I myself wrote about it many times). But it was also knowable what Ben Bernanke would do about it. I bring this all up to make it clear that since the early 70’s (ex the interlude in the 80’s) we have been following bad policies along a continuum at an accelerating rate. In short, in the last 15 years, the country tried to speculate its way to prosperity, then borrow its way to prosperity, and now we are trying to print our way to prosperity. I believe that the next few years will see the end of this 40-year-long, faith based, pure paper money, grand experiment. The way I think about the 2008 "financial crisis" is that, rather than let markets clear and potentially see the financial system collapse along with all that they feared that would lead to, Hank Paulson, Ben Bernanke, Tim Geithner, and Congress combined with an alphabet soup of various government programs to basically give the world a "do over." While that rescue bought some time, and ensures that the ultimate crisis that brings real change to this country will be different, it didn’t solve much at all. In fact, I would argue that those policies and others have only made our situation worse (though that may actually be the good news in the end). As I stated earlier, I closed my short fund in March of 2009 because I felt certain that I knew what Ben Bernanke and his cohorts would do. They would print money - as much money as it would take to ultimately force the bond/currency market to take the printing press away from them. (My nickname for this outcome is the funding crisis.) Despite their efforts, I was pretty sure they wouldn’t get the GDP growth nor the job creation that they expected and wanted, which I felt would lead to even more of the same money printing. Thus, I decided to focus my investment efforts on the beneficiaries of money printing and avoid ideas that required much real GDP growth in order to work. As a consequence of that strategy, I have focused predominantly on gold and gold-related ideas since early 2009. I still have the same basic strategy and, though I have tweaked it as needed, I expect to continue on this same path until the markets finally do take the printing presses away from the central bankers. Initially, my exposure was more to gold itself, as I just traded the large mining companies because they seemed basically uninvestible. But I think that attitude is changing (due to a combination of psychology and value), as I’ll explain shortly. I also bought a package of exploration companies and junior miners, as I think they have a chance to have explosive moves. In addition, they can serve as potential long-term call options that may be easier to hang on to when Mr. Market someday takes gold or the big mining companies so high as to sucker me into giving up part of my positions too soon. Now before I get to my ideas and rationale for them, I’d like to take a minute to refute the popular view that the gold market is experiencing a bubble, because who needs any gold related ideas if that is the case? The problem with gold is that it is just a price, so we can’t easily back up our views of what it’s worth by citing concrete business fundamentals. And since it is just a price, anyone can have an opinion about it, even if they can barely spell gold and they do – it’s a bubble. I suspect vastly more people (especially if they are journalists) are in that camp than those who aren’t, which should be a tip off that it is not a bubble. But the most compelling argument I can make is purely subjective, and that is this: almost all the people who scream "bubble" didn’t see the prior stock bubble or real estate bubble. Meanwhile, nearly all those who did, own gold. Whose side do you want to be on? Those of us who hold positions aren’t so much certain that we know what price gold should trade at. We don’t, which also makes holding it a bit nerve wracking during the periodic air pockets it hits. But what we do know is that the world’s paper money is essentially worthless. Meanwhile, gold is rare and thus it can trade wherever it needs to. How rare is gold? While many are aware that all the gold that has ever been found can fit inside of two Olympic-sized swimming pools, I suspect few realize how much rock and earth must be moved to create the proverbial "marginal" ounce. Turning to the subject of mining specifically, in the July 1st issue, Jim wrote an article about the coming change in the behavior of mining stocks. As one of the coconspirators in that article I’d like to review my reasoning. Since the 2008 crisis these stocks for the most part have performed miserably versus peoples’ expectation (and traded extra squirrelly to boot) leaving shareholders extremely frustrated. That underperformance was for two reasons, in my opinion. The first was that the mining companies had a hard time delivering big earnings gains even with the huge move in gold. As a consequence, they kept losing at Wall Street’s ridiculous game of beat the number. That was a function of many variables (and varied from company to company). but the biggest issue was that for several years the companies' costs were rising faster than gold. Meanwhile, they were all pursuing big capital expenditure projects to bring more gold into production. Fortunately for me, given my views, I have a vantage point regarding the daily/weekly/monthly operations of the mining business that is a bit more up close and personal than that of a lot of interested parties because I am the lead director of Pan American Silver. I have been on the board since 1996, as the company has grown its production from roughly 4mm ounces to 24mm, on our way (assuming Argentina cooperates) to roughly 45mm. As an aside, when I refer to gold as an idea I really mean gold and silver, though due to silver’s volatility, these days I prefer gold, but that wasn’t the case for many years when silver was my favorite. Anyway, last year I began to see the enormous buildup of cash and the potential for that to escalate and I thought that maybe it would excite people, but it really didn’t. And the reason, I think, is because something else was holding folks back and that was the fact that most people expect the price of gold in the future to be much lower than it is today. The reason future expectations matter so much is because of the way miners are valued by the analysts, that being based a discounted stream of future earnings or net asset value (N.A.V.). For instance, if I have a mine with 10 years of proven reserves, producing 1mm oz. per year, my all-in costs are 900$ an ounce (though rising), and the spot price is 1700$, then my business is making 800MM$ a year pretax. Now those earnings may be more or less based on whether my production will grow for some reason, or my reserves might last 20 years vs. 10, but if we think that in two years the spot price will only be 1000$ and stay there, then today’s earnings aren’t worth much of a multiple. On the other hand, if we decide that the spot price might stay where it is or maybe only fall somewhat (let alone rise), then those earnings are worth a lot more from a multiples perspective, no matter what rate I use to discount back those future earnings. That particular mindset shift has finally begun, which is a powerful psychological sea change. Analysts who have held their future price assumptions at 900-1000$ have just started to bump them up (something I expect to see more of after this correction in gold has ended). As you can see, that can have a dramatic impact. In an August 22 report, the analyst at Citicorp raised his long term gold price assumption to 1050$ from 950$ and the next four years to an average of 1437.5$ from 1156$. As a consequence, he upped his target price for Newmont from 55$ to 80$. That same report contained a small table showing that with a long term gold price assumption of 1850$, his target for Newmont would be 200$. I believe that the concept of a future with higher gold prices is an idea whose time has come. In addition, on a relative basis, as these companies report strong results they will look more compelling relative to other companies who might be stumbling due to the economic backdrop. As a consequence, at some point they will also start to capture the eye of the momentum crowd, from both an earnings and a price action standpoint. Those of us in this room who are value-oriented contrarians tend to turn up our nose at those kinds of players, but almost by definition no self-respecting bull market (and certainly no bubble) can end without the momentum crowd running wild in whatever it is. In one of my wild fantasies, replaying the dot.com lunacy, I can see the gold analysts going on Bubblevision to jack their price targets for the miners, because they are raising their gold price projections in the out years. Besides owning gold itself, I have a certain portion of my money in big cap miners. My favorites are AUY, GG, NEM, and AEM. In his September 9th issue, Jim calculated what they could conceivably earn if gold were 2000$ an ounce. It is clear from this exercise that they have plenty of earnings power. Another way to value miners is to calculate what the gold in the ground sells for versus ingots above ground. For example, in Newmont’s case, its 100mm ounces would cost you 350$ an ounce if you acquired the whole company. Adding the 550$ per ounce that it costs to yank the gold out of the ground means that, at roughly 900$ an ounce, the gold with the dirt still on it is a lot cheaper than coins or bars. I also own a collection of exploration/junior miners, a list of which, labeled Caveat Emptor, is in your packets, along with my Cliff notes. I'm not going to spend time on each of these names, as I don’t want to imply a sense of certainty which doesn’t exist. But perhaps these ideas will provide a place for you to start your research. I would recommend that you buy a package of these, as almost nothing is as dangerous as owning just one junior mining company, and be sure to size it right. Unfortunately for you big hitters here, these companies have tiny market caps and for the most part also trade pretty thin, so you may only be able to buy them for your IRA, but I think that many of them will see huge gains. Now for three related ideas. First, U.S. Global Advisors, an asset manager of gold equities and emerging markets, trading at about 13x earnings and yielding over 3%, run by Frank Holmes. They can win in a combination of three ways: higher gold prices, higher valuations, and inflows. Despite respectable results, they have essentially only seen outflows the last four years, something I expect to change. It is basically a long term call option that pays a dividend 3x the 10yr. Next, my favorite mining related idea of all, Energold Drilling. Instead of dealing with all the vagaries of the mining business and the constant worries of new taxes, an alternative idea is to capitalize on all the money the miners will spend looking for minerals, as exploration of one form or another is mandatory in a business where you are constantly depleting your assets. Energold isn’t just a commodity driller; it has a unique niche, a barrier to entry, and a terrific CEO. It builds and uses special environmentally friendly rigs that are also cheaper to use, which accrues to its margins. Here is what the numbers look like: its rig count has grown from 41 in 2007 to 120 for 2012. EPS will be .35-.40$ in 2011 and could be .80$ in 2012. At 3.60$per share and growing rapidly, the stock seems absurdly cheap to me. My last idea is Mongolia. This one isn’t a pure money printing beneficiary, as it requires that world GDP activity drive demand for certain commodities, though it is pretty well insulated from that requirement due to the nature of what is behind the boom. Mongolia is young (the median age is 26), democratic, capitalistic, and the macro numbers are stunning. Sitting on China’s northern border, it’s the world’s 19th largest country by land mass, but has only 2.7 million people. (For perspective, Iran is just a shade larger and has 74mm people.) GDP last year was about 5 billion$ and it could easily grow at double-digit rates for many years to come, as it is rich in minerals and agriculture. The planned capital expenditures to develop just one mine, Oyu Tolgoi, are expected to be 6.5 billion$, which is roughly equal to last year’s GDP. At current metals prices, it will then produce roughly $7 billion in metals every year. People talk a lot about Oyu Tolgoi, but ignore the dozens of smaller mines being built, which in aggregate are many times larger. Along with Tavan Tolgoi (the world’s second-largest coal deposit), these mines will help power the country’s economy for quite some time. Bottom line, the country is as close to a 5-10 year slam dunk as you will ever find. Sam Zell recently opined that Mongolia will become a “massive sovereign wealth fund.” Unfortunately, there are only a few handfuls of listed companies, which trade occasionally, and most have no reliable financials. Meanwhile, other less direct investment vehicles are limited, though a number have sprung up recently and more are probably in the works. Along that line, last December, after one of my smart young friends, Harris Kupperman, made several trips there and did considerable research, we realized there was no good way to capture what we thought was a once-in-a-lifetime opportunity. So we started a public company, Mongolia Growth Group, to invest there. It would be inappropriate for me to stand up here and tout you on a company that I am so deeply involved in, but then again I assume that some of you may wish to know a few details. So I will keep this very brief. So far we’ve raised 36mm$ (including our own money) and currently own about 80 residential, office, and commercial properties in downtown Ulan Bator. We have also partnered with some locals to start the best-capitalized insurance company in Mongolia. We are hoping, among other things, to capitalize initially on an upcoming law change that will require drivers to carry liability insurance for the first time. We also think that there is huge business to be done insuring various facets of the mining projects currently underway. Our plan is to keep growing those two businesses while remaining alert to other opportunities, and given the terrific people that are working for us over there, I’m sure they will find some. There is one more important advantage to investing in Mongolia and that is its currency, the Togrog, which may turn out to be one of the best currencies on the planet if the number two man at the central bank, who is in charge of it, is any indication. On a week-long trip there last month I was able to spend two hours with Mr. Zoljargal, the deputy chairman of the Mongolian Central Bank. He is the most intelligent, plainspoken, common sense oriented public official I have ever heard, and has a complete understanding of the current world macroeconomic environment. More importantly, he pursues his job in a way that anyone here would approve of. His view is that the role of the central bank is to create an incentive for people to save/invest. In his words, “Saving must be profitable” because “savings is the core of the economy.” As far as currency manipulation goes, he feels that the market is basically correct and that it is literally “wrong” to target a certain price level, in an attempt “to change the ratio.” He only intervenes to fight volatility because wild short-term currency fluctuations can hurt business. He has held this post for just about 18 months, but his methods seem to be working, as the Togrog is strong and inflation has dropped from 15% or so to 9%, even as GDP has grown 17%. On the subject of interest rates, currently at 10%-plus overnight (one-year deposits pay over 13%), that is the job of the number one man, but refreshingly Mr. Zoljargal was actually skeptical of the notion that interest rate targeting is an effective tool to manage the economy. His view of the IMF bordered on hatred, as he felt its policy prescriptions were irresponsible and harmful. Rather than overheating as the IMF claimed, Mongolia “was just warming up.” He is very bullish on Mongolia, describing it as “heaven for investors.” And for those who worry that a slowdown in China will have a drastic negative impact, he responds that if “China growth slows to zero, Mongolia will still be fantastic.” Lastly, he holds “the maximum” of his reserves that he can in gold though he wouldn’t divulge what that percentage was. The meeting with him was arranged by the man who runs our insurance company in Mongolia. Fortunately, Ganzorig worked with Mr. Zoljargal many years ago and he guessed that “the maximum” might be 10%. However, it isn’t the exact amount that matters, it’s the mindset, and the upper bounds can grow as the idea continues to gain respectability. I believe the Mr. Zoljargal and the Togrog are showing the way of the future, i.e., a return to a gold-reserve-based currency system. The bonfire of the currencies that is under way has led to such great discomfort the world over that I feel a gold standard will come to be thought of as “not such a bad idea,” especially in an era when governments are already broke. After all, if politicians can’t run deficits to buy votes, then they ought to find abandoning the printing press less objectionable. Despite what seems to me like sound logic, I don’t expect politicians in America to race toward a gold standard, but rather be dragged there kicking and screaming as the bond and/or currency markets eventually revolt, thereby taking away the printing press. In that environment I think a gold standard will come to be viewed as the least bad option (especially the self-correcting nature of how excesses are relieved). If and when that comes to pass, and the Fed is no longer a threat to savers, we can gladly turn in our gold for a sound piece of paper that offers a real yield. Although we may wish to keep our miners for a while longer, as that outcome would drastically ratchet higher the previously discussed N.A.V. calculations. I wish I knew exactly how the funding crisis will start, and more importantly when, but I don’t. I do know though that it will occur, because we can’t print our way to prosperity any more than we could borrow our way there. It feels to me like time is running out and we are nearing the end of the money printing era - and the bubbles that have come with it. As that crisis hits, hopefully sometime in 2012, we can probably make money shorting bonds and stocks, but until then the most efficient course of action for me is to just stay with the types of ideas that I have discussed. We will just have to see how it all sorts out. But no matter how all the billiards balls careen around the table, if we can have that crisis, and put the Fed out of business, then perhaps we can also muster the political will to reduce our long term contingent liabilities and put the country back on sound footing once again.